It’s hard to imagine that before World War II, pizza was little known outside of Italy or Italian immigrant communities. Allied troops, tired of their limited rations, found pizza—and once they returned home, the popularity of this bread-y, cheesy, saucy dish skyrocketed. Join us on February 9 as we celebrate National Pizza Day! 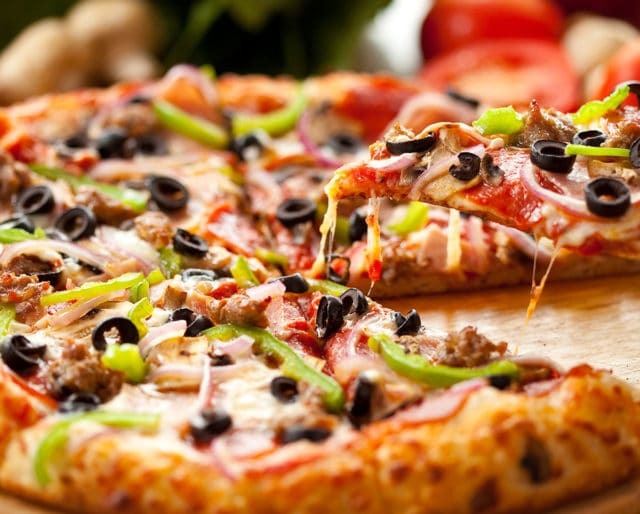 According to the survey, 3% of Americans would rather eat pizza than have a boyfriend or girlfriend. The response among females was slightly higher—4% would rather eat pizza than have a boyfriend, compared to 3% of males who say the same. I mean, why mess with a good thing? No matter what age you are, the words “pizza party” are guaranteed to delight and put a smile on everyone’s face. Pizza for breakfast, lunch and dinner? Yes—that is the kind of perfect world we live in today. Crack an egg on it in the morning. Toss that salad on top for lunch. And why not go for the meat-lovers’ dinner? Chances are, you know your perfect slice down to the finest details. (Mine includes corn, pasilla chiles and feta cheese). But why not break out of the routine on National Pizza Day? We know you’ve been curious about that artichoke pesto pie at the place around the corner. Thin crust or deep dish? Sauce or no sauce? Classic mozzarella or that new provolone? Wood-fired or out of the oven? Part of pizza’s appeal is that it’s never the same and can easily be adapted to changing tastes, preferences, and diets. Admit it, you still remember those grade school pizza parties with a certain sense of child-like glee. Whether it’s the red, white and green of a classic margherita pizza or the sparkle of perfectly cooked pepperoni, pizza adds something extra special, wherever you are. The interplay of cheese to sauce to crust creates an almost addictive food bomb of different aromas, textures and flavors. Other foods are hard pressed to do the same.